Tina’s back modeling another summer top for me and I couldn’t be happier. The conditions were completely different this time around. Photos for the Knitty Fiftyfifty Shell were taken at Lake Tahoe in the middle of winter. It was 8 degrees out and a storm was on the way. This time we were hanging in San Diego on a perfect summer’s day. She was just back from a three week holiday in Italy and her happiness shines through the picture. The Resilient Cast On in 1 or 2 colors which, as you can see below, allows the Chevron pattern to curve. 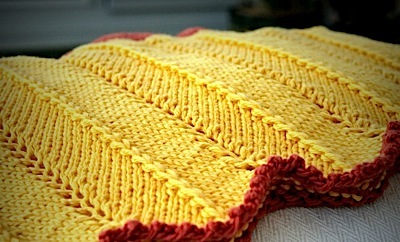 A Central Double Showy Decrease adds height and interest to this popular stitch pattern. We’ll be blogging more about Double Showy Decrease options soon. And, of course, the braided Flat i-Cords add beautiful straps in a way that’s not been possible before. 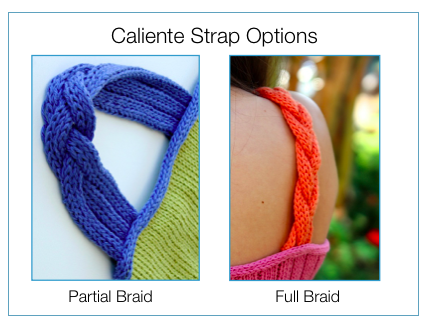 The Caliente Shell also includes a variation of the i-cord bind off. This one has 4 stitches so you can run an elastic cord through the center of it to customize the fit. 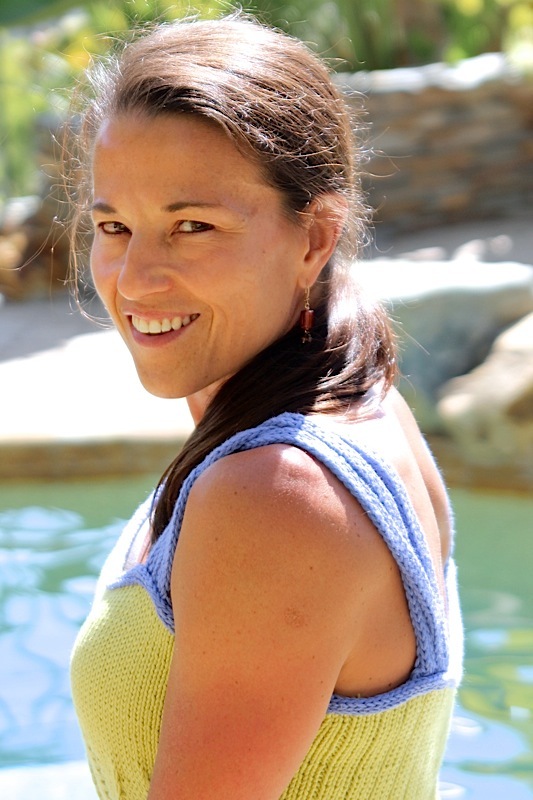 We blogged about it on June 14th when we gave you some tips on knitting a contrasting color i-cord bind off with clean lines. 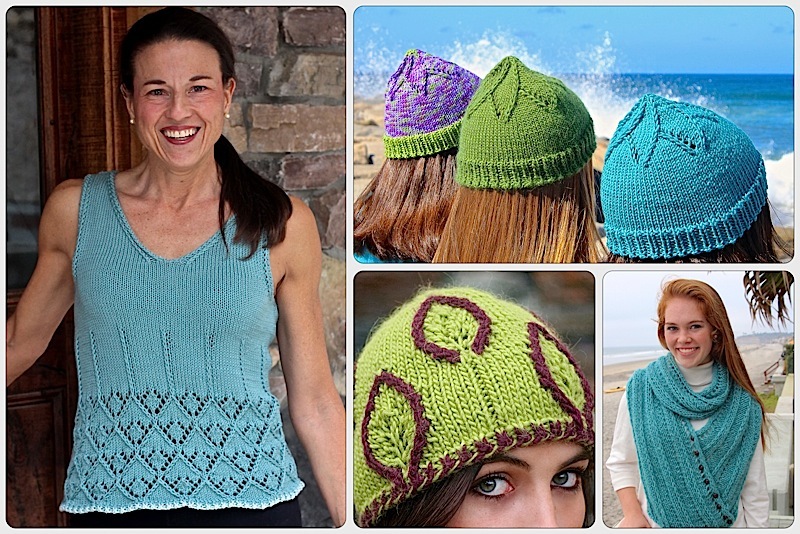 The top is knit in the round with an easy-to-follow stitch pattern and a lot of detailed instructions. If you’re a new knitter, it’s a good project to tackle for your first garment. If you’re an experienced knitter, you’ll enjoy the new techniques and be able to power through the main body knitting. Play with the color combinations to make it your own. You will find more photos on our website . New to the blog? Check out our Getting Started page. For a complete Flat i-Cord tutorial try our Iquitos Scarf. We blogged about it last time. June 14th blog post on the 4-stitch i-cord bind off. The Techniques page on our web site has free tutorial downloads for all our “Nuances”. Read about our charity here. All Flat i-Cord pattern proceeds go to support it. This entry was posted on July 25, 2014 by Laura Cunitz in Flat i-Cord, Nuances, Patterns, Showy Decrease, Tops and tagged Flat i-Cord, Knitting Pattern, Nuances, Showy Decrease.